Tara Hunt posted on Flickr her cover for her future book.Here is her original cover that she posted on flickr. She wasn’t pleased with the direction of the cover and she asked if I could work on the cover design for her. I was thrilled to get a chance to work with Tara. Each project I work on I start off talking to the client to figure out what they have in mind. All clients are different and its a designer’s job to listen. I asked Tara what it meant to her and what she pictured in her mind. The dimensions of the book cover were based on the yellow one that she posted on flickr and I used the copy that the publisher had in the mockup. Since Whuffie was a new term to me, I researched the meaning on Google. Whuffie according to wikipedia is ephermal, reputation-based currency of Cory Doctrow’s science fiction novel, Down and out in the Magic Kingdom…. a person’s current Whuffie is instantly viewable to anyone, as everybody has a brian-implant giving them an interface with the net. I wanted to make sure I what the definition was and that I created a succint message with her book. I used the definition to help me find a concept. 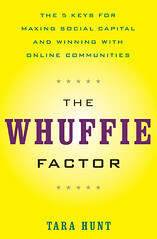 The book was about community and the value of social reputation. Drawing a community was fairly easy. I drew the icons for male and female and kept them a blank slate and white to represent being pure and just starting out on their social reputation.The color red represents Tara having the most heart and reputation. Her “heart/value” on the web being the highest. It took a bit of time explaining something that is intangible like social capital/reputation. 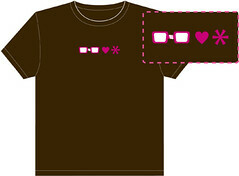 The icon for the computer and RSS feeds representing content being sent out being added to heart equals the target that is what the social communities are. The color scheme for this was based on “heart” it made the most sense to use red to display the human aspect of it. Red is usually used to convey power, passion and humanity since it is the color of blood.All those connotations was part of the message I wanted for the book cover. I wanted blue was for the sky’s the limit but turquiose was the perfect choice for the cover to give it a feminine sophistication to describe Tara’s point of view on social captial but also modern enough to not detract from a male audience. I sent it off to Tara and she was thrilled with the cover and we waited. Random House, her publisher, eventually contacted me and asked me to do some revisions. They became my client and I did a few revisions on the cover for them. The comments were that it needed to be more streamlined for the business audience. Simple enough in one meeting I removed the iconography that Tara wanted (the client now was the publisher and not her). The mockups were now going through the publisher and not Tara. I created a few versions for the publisher to take a look at, unfortunately I am not at liberty to show. I played by the rules stated in the agreement which was that only they would show Tara what the cover was going to be. Oh and just in case you want to buy one for your own collection. 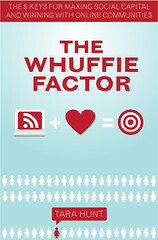 You can find it here on Amazon: The Whuffie Factor. 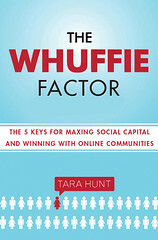 I was lucky enough to meet Tara Hunt at the WordCamp 2009 conference in San Francisco, and heard her 30-minute piece on ‘Whuffie’. Apart from being an engaging presenter with a clear perspective of her subject, she makes excellent points that are crystallized in the book. I’d thought about some of the ideas prior to hearing her but never really formed an over-arching opinion of what it meant - this book convincingly cements some of those concepts.